The transport of chilled or frozen cargoes in refrigerated containers, or reefer units, is a large and steadily growing business. Most container ships can now provide the necessary power supply and some modern ships are able to carry in excess of 1.000 reefer units. These units provide a regulated temperature and humidity and, in many cases, a controlled atmosphere as well. They provide the optimum conditions for the carriage of meat, fish, fruit, dairy produce, flowers and other perishable cargoes. 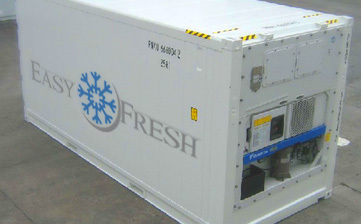 There are different types of reefer container operation, including Cold Treatment, Controlled Atmosphere, and Super Freezer, as well as various important procedures that should be followed in order to ensure correct operation. The safe carriage of these cargoes, many of which have high value, is important for all those involved in the supply chain - the growers or producers, the logistic supplier and other transport companies, and the final consumer. A reefer container is designed to maintain cargo at the pulp temperature prevailing at the time of stuffing. Although the container machinery over a period of time can bring cargo delivered at too high a temperature down to (or closer to) the designated temperature, this is not the primary function of a reefer container. If a container is loaded with a cargo where the pulp temperature exceeds the carriage temperature stipulated by the shippers, the "warm" cargo will cause the temperature of the delivery air to rise very rapidly when passing up and through the cargo. Eventually, the return air may reach a temperature level whereby the refrigeration machinery cannot cool it down sufficiently prior to re-circulating it as delivery air. In this event, the tracking pattern on the chart or logger will show a temperature higher than that of the temperature control setting. The delivery/return air differential will in most cases narrow as the continuous circulation of air, being cooler than the cargo, brings the cargo temperature down towards the desired level. Any rise in return air temperature will be arrested as the refrigeration unit begins to run in standard operational mode. In cases where the stuffing temperature is higher than the stipulated carriage temperature, the refrigeration unit will cool down the surface layer of the cargo relatively quickly (within days). However, the centre of the stow will not reach the desired temperature for a considerable period of time. The temperature of a cargo stuffed into a refrigerated container should not, in general, deviate by more than 3ºC (5ºF) from the specified carriage temperature. Chilled cargo (excluding bananas) should not deviate by more than 0.4ºC (1ºF). This does not mean that even these deviations should be encouraged; the objective is to receive and deliver the cargo at the carriage temperatura. During the operation of a refrigeration unit, a layer of ice will form on the evaporator coils depending on the temperature set, the temperature of the cargo, the amount of fresh air ventilation and the cargo humidity. The unit periodically enters a phase where heat is produced by a series of electrical bars, allowing defrosting to take place. At such times, all fans are turned off automatically in order to prevent heat from entering the cargo compartment. However, the return air temperature sensor is so closely located to the refrigeration machinery that the temperature record will inevitably register some of this rise. The record will therefore display periodic temperature increases in keeping with the defrost periods. It must be stressed that these increases, which are conspicuous on paper chart recorders, have no immediate effect on the actual temperature of the cargo and are not an indication of an unstable refrigeration unit. Electronic loggers usually indicate the timing and duration of defrost periods in addition to temperatures. If, as described in the previous section, a cargo is loaded into a container in a "warm" condition exceeding the specified temperature, the refrigeration unit will automatically work to bring the cargo temperature down towards the correct level. This unintentional strain on the unit may result in a heavier accretion of ice on the evaporator coils, leading to an increase in the defrost patterns recorded. Recorder charts do not identify refrigeration unit defects, but do give useful indications of correct operation. Data logger records may give detailed information about system faults in addition to set point, delivery and return air temperatures. Container temperature recording systems do not usually record actual cargo temperature, only air temperatures, but cargo temperature may be recorded by shippers' loggers within the stow. Should a refrigeration unit cease to operate, the chart or logger will register a gradual but steady rise in temperature to the point where eventually the ambient temperature is recorded. Again, the sensor will record an air temperature and the record will not accurately reflect the true position regarding the cargo itself. The cargo will be reasonably well protected from the influences of the external air temperature by the surrounding insulation. There are many other situations where the record may not be a precise representation of the temperature or condition of the cargo within. These examples are given merely to warn that conclusions should not be drawn automatically from the temperature tracking pattern alone. Description: The reefer has integrated container design (machinery/box) eliminating thermal bridges, resulting in reduced heat leakage and improved energy efficiency. Further it increases loading capacity by 100 kg. This container provides a Controlled Atmosphere, whereby nitrogen is actively being injected into the container to keep oxygen and carbon dioxide levels stable during transit. This feature is useful for products such as stone fruit, blueberries, kiwi, sweet corn, lettuce and apples. Description: This reefer offers CFC- free foamed-in-place insulation. The Deep Frozen is able to maintain temperatures as low as -60°C. It offers an unbroken cold chain to the final place of delivery, includ- ing store door delivery and it reduces cold-storage costs. Further by using a special Stuffie container, stuffing can be performed directly from the fishing vessel. Max payload is 29.5 kg. Max payload: 74,957 lb / 34,000 Kg. Description: 45’ pallet Wide High Cube Reefer containers also called cooling containers are ideal for transport of europallets goods which are temperature sensitive. Because these reefers are slightly wider they can transport more pallets as a standard 45’ High Cube Reefer. Insulated containers requiring an external refrigeration source. These units are often referred to as being of "port hole" or "Con-air" design. It is expected that they will be gradually phased out. The second, and by far the largest group, consists of insulated containers each fitted with an integral reefer machinery unit, often known as "integrals" or "reefers". Prior to delivery to a shipper, an integral unit container must be subjected to a Pre-Trip Inspection (PTI) arranged by the carrier or his local agent, which involves the refrigeration machinery being run and tested by a specialist engineer, usually within the port area. During a PTI the machinery is checked, faulty parts are repaired or replaced, and thermostatic temperature recorders (if fitted) are wound up and calibrated (normally at 0ºC). If the cargo is to be carried under controlled atmosphere (CA) conditions, gas controllers must be correctly set and fresh air vents must be closed. Instructions should be issued regarding the steps to be taken in the event of gas control failure, which may include opening fresh air vents when switching off the CA system. In tropical or sub-tropical regions, it is preferable that containers are loaded in a temperature controlled environment (eg chilled warehouse). However, if loading in ambient conditions, containers should not be pre-cooled before stuffing except in exceptional circumstances as this may lead to the development of excessive condensation on the inner surfaces of the container. Refrigeration machinery should always be switched off when the container doors are open to minimise the accumulation of moisture on the evaporator coil, the only exception being loading or devanning using a cold store tunnel. In CFS operations, the carrier's seal is attached immediately stuffing has been completed, recording the serial number on all shipping documents. In shipper-stuffed units, it is not normally possible for the container to be sealed by the carrier or his representative until the container has been returned to the container yard for shipping out. On receipt, a seal should be affixed without delay and the details again noted on all documents. It is particularly important where veterinary seals are attached to containers that all details are noted and the seals checked for signs of interference on arrival at the container yard. Imports to the EU, USA and Japan will only be permitted if veterinary seals are intact on arrival, thus confirming the cargo has not been tampered with in any way during the transit. At intermediate ports, the vessel or her agents must reconfirm the security of all such seals and this fact must be noted on the accompanying documentation. For cargoes classified and labelled as "Quick Frozen", there are special EU importation requirements which demand correct temperature maintenance from the point of production, which may be prior to receipt by the carrier. In such cases, the carrier needs to have evidence of previous temperature maintenance. Many chilled cargoes (e.g. fruit) are regarded as a "live" cargo since they continue to respire post harvest and as such are susceptible to desiccation (wilting and shrivelling). This is not the case with commodities such as chilled meat or cheese. The minimum fruit carriage temperature is usually no lower than -1.1ºC (30ºF). Frozen cargo is regarded as "inert" and is normally carried at or below -18ºC (0ºF). However, both categories are highly perishable and require care in handling to ensure arrival in optimum condition. In chilled commodity transportation, the ventilators are normally left in an open position, with a limited number of exceptions (eg meat, chocolate, film, chemicals, dairy products, and controlled atmosphere shipments). Some cargoes may require controlled humidity (eg flower bulbs). It should be remembered in such cases that many refrigeration units are only capable of reducing humidity within the cargo space and the settings should be applied accordingly. Those units which can increase humidity may incorporate water tanks with special cleaning and hygiene requirements to avoid contaminating the cargo. Controlled atmosphere carriage involves the use of specialised containers capable of substituting the oxygen levels with nitrogen and carbon dioxide in order to extend the post harvest shelf life of the product. This method is suited to many soft and stone fruits, but requires specialist knowledge to determine the most appropriate gas concentration levels. Correct stowage is extremely important to the carriage of containerised reefer cargo. However, this is seldom under the control of the carrier, who often receives a sealed container "said to contain" a specific cargo. With frozen cargo, the objective is to provide a circulation of cold air around the cargo to reduce the possibility of temperature variations at the boundaries (eg walls, floor and roof). With chilled live cargoes (eg fruit and vegetables), the air flow must be allowed to permeate up and through the cargo stow, removing product heat, carbon dioxide, ethylene (if present), moisture and other residual gases in the process. Cargo must never be loaded above the red line marked inside the container. This space must always be left to allow an uninterrupted flow to the front air intake. The ideal stowage pattern should permit free movement of delivery air whilst restraining any movement of the cargo. Adequate space must be left above and below the stow to allow free air circulation (see Figures "1" & "2"). Frozen products require a very simple stowage arrangement provided they are loaded at the specified carriage temperature. This can be achieved by a solid block stow, with no space between the stow and the container walls. When carrying frozen cargo, the fresh air ventilation hatches must always be closed. It is important to ensure that the cargo stow covers the entire floor area, projecting beyond the rear floor restrictions of the "T" bars in order to prevent the air short circuiting, and to facilitate an effective flow of return air. In larger containers, if the cargo volume is less than the space in the container, the stow should be of uniform height. As stowage plays an important part in maintaining the quality and security of the cargo during transit, it is essential that specialist advice is sought should there be any doubts when a cargo is booked. The pulp temperatures of chilled fruit and vegetable cargoes and core temperatures of frozen cargo must always be measured, where possible, before a reefer unit is stuffed. Fruit and vegetables should also be checked for pre-cooling damage, mould, wilt, dehydration, shrivel, discolouration, soft spots, skin break and slip, bruising, chill damage and odour. Frozen cargoes should be checked for dehydration, desiccation, fluid migration, odours, black spot, colour and flavour changes, and should also be examined for signs of any upward temperature deviation and subsequent re-freezing. Cartons, trays and other packaging should be scrutinised in respect of their suitability to protect the cargo during a long sea transit.